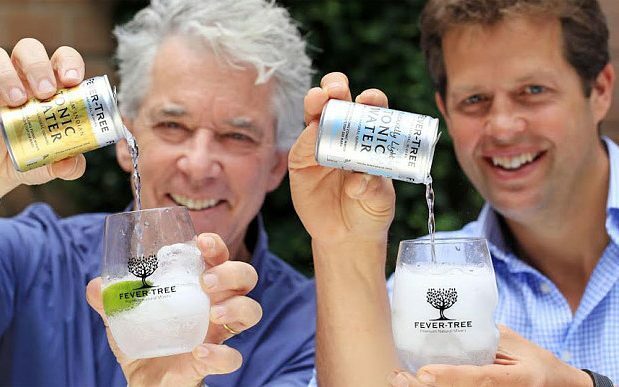 The co-founder and chief executive of posh tonic maker Fever-Tree has said he is not thinking about succession planning after 12 years at the top as the company again looks set to smash profit expectations. Tim Warrillow, who alongside Charles Rolls started working on an upmarket tonic in 2003 before launching their company two years later, said he was “as enthusiastic, if not more so, than ever”. Fever-Tree shares have risen more than 1,100pc since listing in November 2014 and jumped 10pc on Tuesday on the back of a trading update that said profits would be “materially ahead” of what analysts were expecting. Shares rose as much as 12pc on the news to ?22.09. Mr Warrillow became almost ?30m richer in July after cashing in on 1.5m shares the day after a prior profit upgrade sent its shares up 20pc. The chief executive said a major factor in the profit upgrade had been its robust performance in the UK, where it has shut out all potential invaders looking for a slice of the premium mixer category. The mixers market has grown 20pc in the past 12 months, according to Mr Warrillow, who added his company had accounted for 97pc of that uplift in the sector. Far from being a saturated market in the UK, Mr Warrillow said Fever-Tree was now being sold in more hotels, bars, restaurants and retailers. He added supermarkets were also making more space on their shelves for Fever-Tree and had started opening up hallowed ‘secondary space’ - such as the end of aisles or standalone displays usually reserved for the fastest-selling products. In spite of Fever-Tree being positioned as a premium product, Mr Warrillow said he had not seen any effects on the company’s sales from the rising fears about a squeeze on consumer spending. “While it is a premium product it is a very low-cost luxury item and its resilience has been proven time and time again in recessions, which these products weather extremely well,” he said. The chief executive said the company had witnessed 80 competitors launch globally since it started in 2005 and even large players in developed markets such as Schweppes and Britvic had not gained as much traction as commentators might have expected. Fever-Tree is now in 70 countries and while there were intentions to enter more, Mr Warrillow said the focus was on growing its presence in places it already traded. Analysts at Investec lifted their prediction for full-year pre-tax profits at Fever-Tree by 11pc on the back of the trading update to ?54.5m on sales of ?158m.